"They're everywhere. Their name is like a talisman that opens all doors and bends all wills. The man who can pronounce that name is master everywhere -- Gentlemen of the night!" 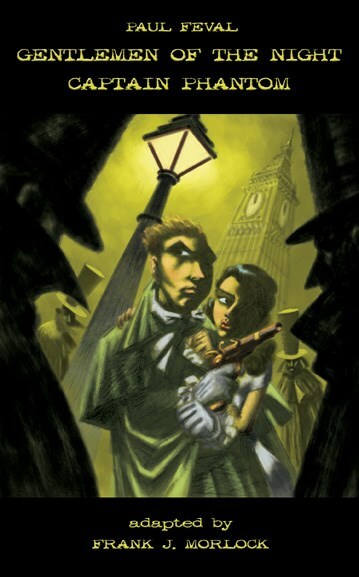 In 1830 London, the Marquis de Rio Santo, leader of the criminal empire known as the Gentlemen of the Night, schemes to free Ireland by plunging England into chaos. Our soldiers believe in the existence of a supernatural being, a fantastic cavalier, dressed in the uniform of a French dragoon, who hides his face behind a black mask -- Captain Phantom! In Spain during the Peninsular War of 1808, Don Cesar de Cabanil becomes the mysterious Captain Phantom to fight for justice and protect the innocents in his war-torn country. Paul Féval's greatest claim to fame is, undoubtedly, having been one of the founding fathers of modern heroic fiction. He developed the concepts of criminal masterminds in The Black Coats and its predecessor, Gentlemen of the Night (1843) and anticipated masked swashbucklers like Zorro with The White Wolf and Captain Phantom (1862). Both plays are translated by playwright Frank J. Morlock.